The ArtVilnius fair is one of the great success stories of Eastern European contemporary art. It was perceived as a one-off when launched in 2009, the year that Vilnius was the European Culture Capital, but, operating on a shoe-string budget of around €700,000, it has become an annual event. This year it ran from 7 to 10 June, attracting 22,700 visitors to the Litexpo exhibition centre on the city outskirts. It is run by Diana Stomienė, the president of the Lithuanian gallery association, and the boss of one of the top city galleries, Meno Nisa, where the fairs artistic director, Sonata Baliuckaitė, is curator. Baliuckaitė denies any conflict of interest: “Galleries are happy because we participate in other international art fairs and know whats needed”. ArtVilnius is sponsored by Lithuanias culture ministry and the city of Vilnius, whose mayor, Remigijus Simasius, believes that it would be difficult to imagine life in Vilnius without certain annual events and “ArtVilnius is one of them. Painting and figurative art feature more prominently than in many fairs. To Simona Jurčiukonytė, a student at the Vilnius art academy, the fair is “a bit traditional and unadventurous”. To others, however, this is its strength. Sasha Shchelushenko of Tsekh Gallery in Kiev has sold so well with his intricate drawings by Ievgen Petrov that he has opened a subsidiary gallery in Vilnius, and now divides his time between Ukraine and Lithuania, where, he declares he is targeting “bigger fish”. Other foreign exhibitors cater to the local market by bringing Lithuanian artists. Thorkild Nielsen, of Denmarks NB Galleri, returns each year with psychedelic canvases by Vilmantas Marcinkevicius. Kovcheg of Moscow bring abstract works by Vigintas Stankus . Fifty-four galleries from 11 countries were present, the majority from the Baltic States, followed by neighbouring Poland, Russia and Belarus. Two of Rigas top galleries made an impact: Tifana with an exuberant Aija Zarina solo show, and Alma with Ivars Drulles solo project To My Homeland. Haus Gallery from Tallinn, one of five Estonian galleries, displayed Maarit Murkas striking 2017 painting Out of Context. The presence of foreign galleries has benefited the local scene, says Diana Stomienė. “Lithuanian galleries are working better and better every year”, she says. They are also becoming more varied. Stomienės Meno Nisa Gallery set the pace this year with a four-wall video by Rimas Sakalauska, while Offering (2018), a stuffed, pearl-clad, young wild boar, by Danielius Sodeika & Birute Sodeikaite, caused consternation at Kauno Langas gallery. 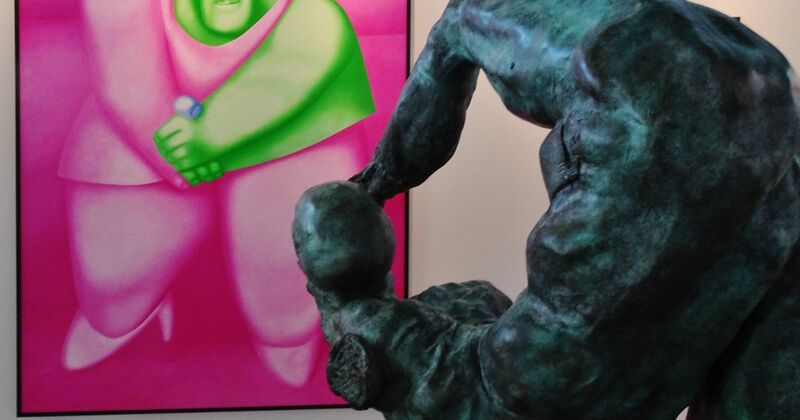 The famous Russian non-conformist artist Oleg Tselkov added kudos to the stand of Arty Cube of Vilnius with his large pink and green Walk, among the fairs priciest works. Young Lithuanian artists were shown by the National M.K. Čiurlionis School of Art, where Austeja Mankeleviciutes wax and paraffin composition Jungtis (2018) caught the eye. ArtVilnius also included a section devoted to large-scale, non-commercial projects. Every year a crowd-pleasing highlight is an installation by the Stuttgart-based, Lithuanian-born kinetic artist Kestutis Svirneli. A many-armed inflatable, resembling a giant centipede, was his 2018 contribution. ArtVilnius runs a city-wide gallery nightduring the fair, which this year expanded from 15 to 20 venues, including Vartai (Lithuanias best-known gallery internationally does not take part in the fair). Meanwhile the National Gallery was hosting “artworks and soundtracks” from the local Lewben Art Foundation, while the Contemporary Art Centrestaged the Lithuanian leg of the Baltic Triennial (until 12 August). The next Vilnius contemporary landmark to open, on 18 October, will be the swanky new MO Museum, which hoststhe 4,000-work collection of Viktoras and Danguolė Butkus. Have you seen these photos of Ranveer Singh, Anushka Sharma and Janhvi Kapoor? Will California use its budget surplus to house the homeless? Janet Jackson took to the stage and wowed the crowds following fathers death (Picture: Donald Traill..
Claude Monet's Nymphéas bleus (1916-19) and Philip Guston's Dial (1956) Monet: Musée dOrsa..